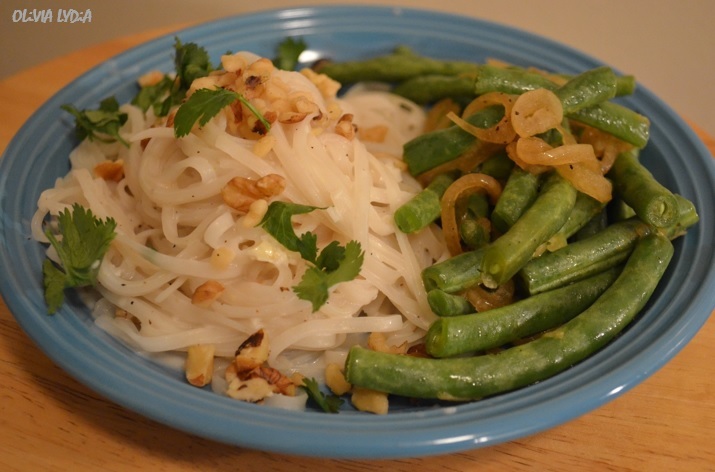 Garlic coconut noodle with string beans – Olive For Greens. I love coconut anything! Thai cuisine uses a lot of coconut milk in their food. I thought it was strange at first but when I gave it a try, I was not sorry. Pad Thai Noodle may be new to you but they are cheap and can be found in the Asian food section at any grocery store. This meal is simple and filling. It has a nice semi-sweet more savory element to it. The walnuts give texture to the noodles and pair nicely with the coconut flavor. Tip: If you do not have fresh cilantro used dried. Please note, it will not taste the same. Cilantro gives these noodles an extra notch of flavor. Boil the noodles until al dente (read packaging instructions). In a large sauce pan add coconut oil, garlic, salt, pepper and ginger. Sautee on low for 2-3 minutes. Add the coconut milk, walnut then the noodles to the sauce pan. Mix together until sauce thickens. Tip: Use canned green beans, like Del Monte, if you like. In a sauce pan add the sesame oil, onion and garlic on low heat. Sautee for 5 minutes. Add tamari and vegetable broth. Then add the string beans to the sauce pan. Cover with a lid for 5 minutes. Note: Pad Thai Noodle can be purchased at $3 or less. Coconut milk is about $1. Cilantro bunch is about $1 or less. Walnuts cost about $6-$7 for 16oz (2 cups). This recipes calls for ¼ cup that’s less than $2 worth! Previous Post From Yo-Yo to Yo! Pingback: Saving Bucks! | OliveforGreens!